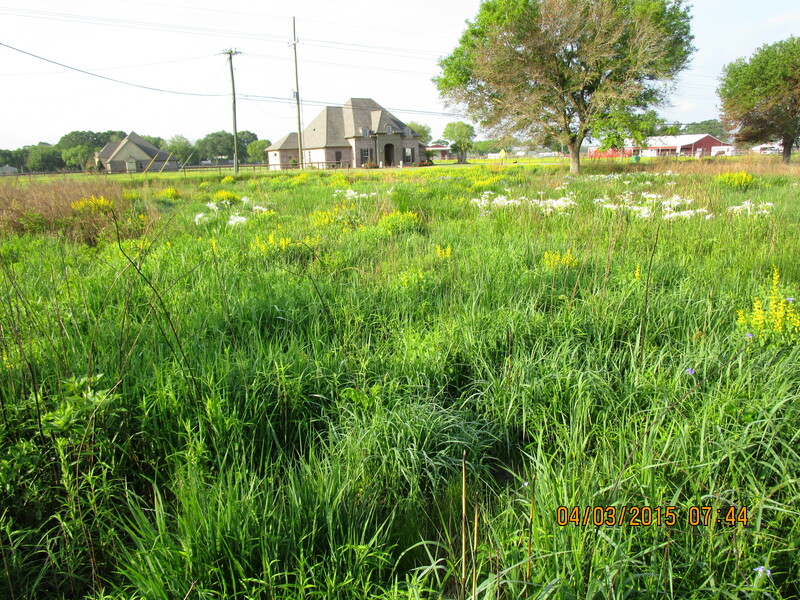 Two views of the Cajun Prairie Gardens in April. Baptisia sphaerocarpa (yellow = Yellow Wild Indigo), Hymenocallis liriosme (white = Spiderlily) and Tradescantia spp. (blue = Spiderworts) predominate these floral views. Aldo Leopold (http://www.aldoleopold.org/Programs/shack.shtml ; The Sand County Almanac) and Lorrie Otto (http://www.wchf.org/inductees/otto.html ) come to mind immediately in any rambling about natural landscaping, also known under the monikers, wildscaping, butterfly gardening, pollinator gardening, biodiversity garden, and many more. We can readily add Lady Bird Johnson (http://www.wildflower.org/ ) to that list as a southern representative of this famed group. The common theme that ran through their lives is a reshaping of our landscape from the post World War II lawn (a literal golf course) to a more natural theme focused on native plants, wildflowers. The inclusion of wildflowers in the landscape immediately enhanced populations of birds, butterflies, and bees as obvious visitors/residents but also began the reconstruction of the soil into a living system. The mere reduction in mechanical and chemical abuses to the landscape was enough to reignite the mechanisms of nature and permit the creation of a new community, which with a little help, may begin to look like a reassembled historical community with natives playing central roles in the landscape. Communities within ecosystems are evolved constructs. In defining them, we allude to the more obvious species, often called indicator species, in order to name them, e. g., juniper forest, coral reef, redwood forest, pine savanna, etc. In analyzing communities, we discover species that appear to obviously play key roles in maintaining the community structure, and we label these species as keystone species, e. g., wolf, buffalo, big bluestem, and monarch butterfly in prairies. The removal or diminishing of populations of any one of these keystone species causes dramatic changes in the subsequent community. Additions of exotic species are important here, as they commonly become keystone species as their numbers increase and the resultant change in the community is equally obvious. Humans immediately become a keystone species in any community that they invade and usually markedly impact the community within a short amount of time. We are famous for bringing exotic species with us and rapidly eliminating native species within literally moments of arrival—forever changing ‘immediately’ every community that we invade. For generations we had this knowledge and we made a ‘decision’ that this was good—environments were best when redesigned by man for his immediate benefit. This ‘manifest destiny’ has become literally the cornerstone of the definition of man. Since Aldo Leopold’s ‘Land Ethic,’ a conservation movement that embraces man’s integration into nature has grown slowly. Leopold also was the first to begin restoring prairies in Wisconsin, both on the University of Wisconsin campus and at his beloved home, the ‘Shack.’ He hoped that his example would be infectious, but it is a low grade epidemic, which has in fact made it to Louisiana under the inspired leadership of Charles Allen (prairies) and Bill Fontenot (bottomland forests) in the mid-1980s. The community forms a matrix within which life can exist. Of course, this is most easily observed in symbiotic associations, and it can relatively easily be extended in studying predation and competition among community members. But these are the obvious connections. With growing piles of evidence from nearly every venue in ecology, the list of connections between living things within and between communities is growing almost exponentially. Unfortunately, many of these connections are recognized as community members suffer extreme population declines or extinction. Alas, as I often refer to my studies in ecology as a collective ‘post-mordem’ on life on this planet. We are learning as we are watching the biodiversity literally slip away from our planet. This is tragic and we humans must recognize what is happening. The prognosis is simple—we will disappear side by side with the other members of our community. The remedy is an immediate change in our behavior, which can begin in our front yard—our future classroom of reality. The recent development of the hand-held device as the literal classroom should be companioned with a hands-on landscaping project in our front yard—in every front yard. Each form of landscaping with natives has a particular focus: butterflies, pollinators, wildflowers, birds, range grasses, etc. They are all excellent concepts in landscaping. Whatever form landscaping with natives takes on, it is beneficial to nature. Exotics may provide food for some butterflies and birds, but they often spread and crowd out natives in locations where no one is controlling them. 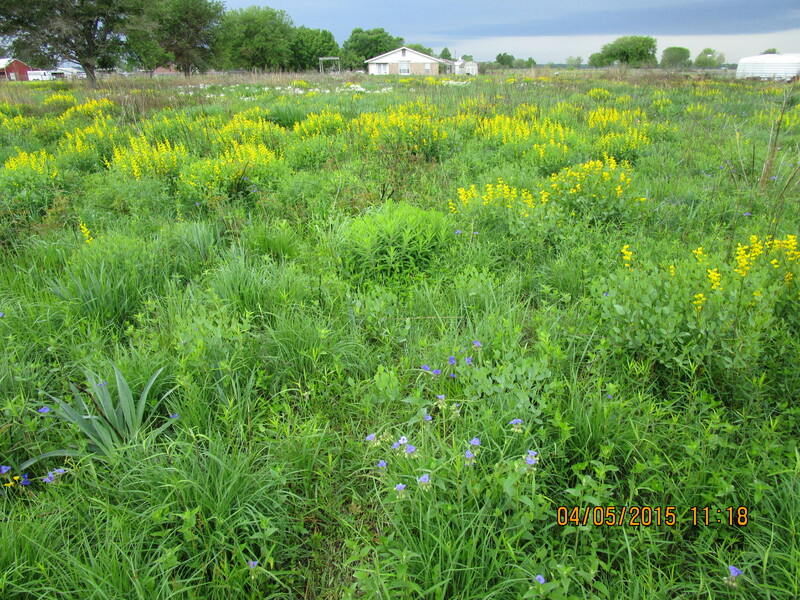 Whether the focus is trees/woodland or wildflowers/prairies or grasslands, the use of native plants provides habitat for native animals and the potential for developing a soil biota that can result in a resilient landscape that can withstand violent climate change. Many popular myths surround natural landscaping and landscaping for wildlife. Let’s debunk a few. Goldenrods (Solidago) cause sinus/respiratory allergies—they are simply blooming at the same time as the culprits—the ragweeds (Ambrosia)—a group of sunflowers without petals or sepals with windblown pollen. Goldenrods are pollinated by bees, butterflies and other insects. Uniformly appearing lawns are neat—actually they are literally dead—uniformity is a sign of ecological death. Diversity is life. Millions of acres are manicured in developed countries—a phenomenon that shows no abatement even under the huge pile of data mounting to alarm the public. Andy and Sally Wasowski (The Landscaping Revolution and Requiem for a Lawnmower) focus on the highlights of this data and provide compelling motivation to put these lawns in perspective. Natural landscapes are breeding grounds for mosquitoes. Actually native plants develop deep and complex root systems that literally remove water from the surface. It is the swales in lawns that breed large numbers of mosquitoes and the lights around the home that attract these mosquitoes. These swales drain slowly as lawns usually have shallow and weak root systems, with the weakest and shallowest root systems in the swales—just observe the first areas of the lawn to die back in a moderate drought—that death signals the lack of a root system. The same weeds that are the bane of our existence are the required hosts for many insects that are not only beautiful but also pollinate our fruit and vegetable crops and serve as food for young songbirds of nearly every kind. On the other hand, those remarkable exotic ornamentals that give us so much pleasure and pride are useless in providing food for insects and of course the nestlings of our songbirds—literally these plants are pretty to look at but mostly useless otherwise. Putting out seeds for birds is a heavily reinforced national tradition—Walmart and other big box stores sell sacks of seed at a time in this effort. The myth is that this activity will somehow preserve the populations of the songbirds in our neighborhoods. The missing link in reasoning here is that the chicks/nestlings of many songbirds don’t eat seeds but rather eat insects like caterpillars. Caterpillars are not generally sold and unfortunately are usually found only on specific native plants and almost never on exotic plants in the landscape. The notion I think is that adult birds regurgitate these seeds and feed their young is the basis for this myth. We are feeding the adult birds but we are leaving the baby birds essentially without food by removing native plants used by the caterpillars that serve as the food for the juvenile bird. Doug Tallamy (Bringing Nature Home; https://search.yahoo.com/yhs/search?hspart=mozilla&hsimp=yhs-006&ei=utf-8&fr=ytff1-yff30&p=doug%20tallamy%20you%20tube&type= and many other videos) focuses on this point in every venue and talk. Try this talk for a good introduction into his efforts: https://search.yahoo.com/yhs/search?hspart=mozilla&hsimp=yhs-006&ei=utf-8&fr=ytff1-yff30&p=doug%20tallamy%20you%20tube&type= . This is essentially the same story as that of adult butterflies for which we plant millions of nectar plants (many exotic) and forget about plants that the caterpillars require for survival. The notion I think is that caterpillars are like the adult butterflies and can eat a wide variety of plants—this is just not so—some populations of specific butterflies are not only limited to a single species, but also limited to specific natural varieties within that species. Monarch butterflies are ‘lucky’ in that they are adapted as rather generalist feeders while caterpillars—they apparently eat nearly half of the many widespread member species in the genus Asclepias—the milkweeds—and milkvines (by the way once they reach a certain size, they occasionally eat other plants, but they noticeably diminished while doing so—little is known about their success in doing this). In the end, it is the kids of nature that we are forgetting in our broad stroke approach to preserving wildlife. The answers are simple: plant native plants and don’t spray them or treat them with biocides—the biocides kill the caterpillars that are food for the chicks. It is all connected. This story extends into hundreds of examples. For example, farmers used insecticides to kill rice weevils and were surprised to find out that residual insecticide killed larval and juvenile crawfish in Louisiana (tests on residual insecticide were done with adult crawfish and found to do no recognizable harm). Years were required for the residual insecticide to abate before crawfish could be grown in rice fields after insecticide treatment. Another example is BtCorn—a GMO corn that produces an endotoxin that destroys the intestine of insects. BtCorn kills the caterpillars that munch on the ears of corn, but the pollen of the corn also has Bttoxin and lands on nearby milkweeds killing juvenile Monarch butterflies (and probably many other butterfly juveniles). Again toxicity tests were conducted on adult and large caterpillars, and results indicated that minimal harm would be incurred by foraging insects on non-corn hosts. Again, it is the kids of nature that we are forgetting in our broad stroke approach to preserving wildlife. If you’re all out for ‘honeybees,’ then you must not know that honeybees are also exotic. We are in the midst of a massive increase in the interest in pollinators, with the poster child for the movement represented by the Old World honeybee. These honeybees are a crop in the sense of a herd of cattle. Illusions of them as naturalized have some foundation, but for the most part, they are literally an agricultural entity, as are in fact our lawn grasses. I do not wish to contest the importance of the honeybees to our society and food chain, but I want to impart their actual role as an exotic animal brought here to produce ‘honey’ and pollinate exotic plants. They do pollinate some native plants, but they do so poorly as compared to native bees, of which there were thousands of species, and honeybees ignore certain native plant species. Honeybees compete with native bees for available pollen and nectar, and the native bees more often than not come in second or last. The recent trend to treat seeds with neonicotinoid insecticides is wreaking havoc with honeybees and pollinators in general. The seeds are treated with this potent insecticide—so potent that the entire plant retains enough insecticide in its parts for months to overwhelm the unsuspecting herbivore. The crashing populations of honeybees has been noted by both our government and Monsanto—each with a tremendous potential liability on their hands. Redefining man as part of a community was key in Leopold’s ethic. The impact that we have on the landscape is so dramatic and dangerous to our well-being as a species that this impact must become an essential part of our schooling—in the last essay I suggested that it might best be thought in a classroom focusing on economics, but it usually is thought as a sidebar in biology, philosophy or creative writing. This is really a lesson in evolution as well as ecology. Communities of living things evolved together and, as such, form a living fabric. That fabric is altered in dozens of ways by human actions that include plowing, biociding and introducing exotic plants and animals, while eliminating key native plants and animals. Our ignorance of the nature of local biological communities imperils our own economics and health. Our ignorance of the evolution of these systems imperils the existence of our species, but then that is a central thesis in evolutionary theory—fitness ultimately leads to survival and reproductive success, and our ignorance is a sign of our growing lack of fitness. Biodiversity and conservation would in my school would make up a single course/discipline and would weave together biology, economics, politics, sociology and all of the major sciences, especially physics and chemistry. Further it would bring with it a home project involving landscaping some small element at home or in a public garden—as hands on projects are essential for the full appreciation of the role of biodiversity and the impact of the smallest effort at conservation. • Flight seasons of insects and birds. • Soil as living fabric. Posted by M. F. Vidrine. Ecological Services–A second ecological primer.